Game of Foams: Monroe Park fun. Thwack! Smack! 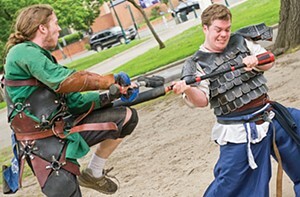 Stroll through Monroe Park on a Monday, Wednesday or Saturday afternoon and you’re likely to see a handful of guys (and some girls) whacking each other with padded swords. This is the Galatia Mercenary Co., a medieval-foam-combat group with about 50 members. There are no dragons to slay or spells to cast. Just good old-fashioned beat downs — called boffing — that don’t leave too many bruises. If you’re interested, just show up between 2-5 p.m., pick up a sword and start swinging.